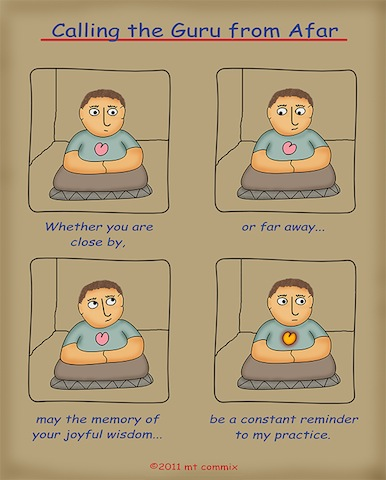 Dear Dharma Brothers and Sisters,I hope you have all been happy and healthy. Here in the Kathmandu Valley, it has been a day of prayers and longing for a Great Nyingma Master who recently entered Parinirvana. On an occasion like this, I’m reminded of the prayer, “Calling the Guru from Afar”by the Great Rime master, Jamgon Kongtrul Lodro Thaye.When reciting this prayer, it is crucial to have a firm condifence in the fact the one’s Guru personifies all the Buddhas of the three times. By gaining certainty in the Root Guru, the student naturally develops unwavering devotion and gratitude towards the Three Jewels. And with the generated stability and certainty, the student then progresses on the path. Once on the path, the student develops certainty in the practice and with devotion and veneration in the Root Guru, fruition is attained. Therefore when reciting the prayer, recite it with certainty, veneration and devotion. Most importantly, we have to look at our own conduct and experiences, how we go through the day without any mindfulness. This is reinforcing our samsaric habitual tendencies, but we don’t see how we waste our time, we don’t see it as meaningless. Why do we not have regrets, consciousness or mindfulness? Why we don’t have any renunciation towards samsaric and mental activities? Why do we have so much activities and emotions, including positive emotions? Suffering is easy to abandon but we find it difficult to let go of any pleasure that we feel, any enjoyment that we have. The feeling of suffering is suffering of suffering, the feeling of joy is suffering of change, and the neutral feeling is the all-pervasive suffering. Whenever you feel that you lack something, this arises from the habits that you have from the past. The suffering in samsara is not supposed to make you depressed. Being depressed and having renunciation are two different things. Mere suffering is when you are sucked into the meaningless suffering of samsara. Renunciation is when you know how to be free of that suffering and wanting to be free from that suffering. It will make you not waste your time, not be completely distracted to your daily activities and make wiser choice to follow the dharma to attain enlightenment. What is actually a meaningful life? Using your time and effort towards the right path, the dharma. Doing something without good motivation, or doing activities with good motivation but acting without mindfulness, being completely distracted is like coming back from an island of jewels, empty-handed. Laziness, having a choice to meditate but not taking that choice, is also coming empty-handed. Having right motivation, right mindfulness and right meditation or practice to have a meaningful life. We ask the guru to bless us to remind us to practice every moment. Thinking of impermanence is very important and the thought that I am may die today becomes a good reminder of it. On the contarary, we normally like to think that we will live until 90, work till we reach 50, and then spend 20 years practicing in retreat, and then spend the remaining in enjoyment. Impermanence makes you serious and cautious about your time, not meant to make you sad. It should transform your motivation to do your practice and a reminder to be more diligent, not to make you have fear. There are different attitude towards impermanence – there are some people who celebrate death, some who are indifferent and some who fear even the name of death. If you are in the third category, you need to spend less time thinking of impermanence, and if you are in the second category, you need to spend more time. There are a few ways of looking at impermanence – one is thinking that the individuals around you are dying one by one, and soon it will be your turn. Secondly, thinking that the time of death is uncertain. Thirdly, some people don’t care about death but don’t know how to practice when they die, so they should learn from today how to practice at the point of death. However, we should be careful that impermanence does not become a motivation to practice the dharma. Fear of death being the main motivation to practice dharma is a lowly, samsaric motivation. Death should boost your practice but not be your motivation to practice. From behind, we are chased by the fierce red wind of karma. And so we must experience the unbearable sufferings of the lower realms. Guru, think of me, behold us swiftly with compassion. Bless me so that we are liberated from the chasms of lower realms. We work so hard to make all our family and friends happy, to earn money and possessions. We spend a lot of money and time to improve our health. However, we don’t have any good results from all this time and effort – it’s a bad investment. However much we work for our family, they will die one by one. When we die, our possessions will be enjoyed by someone else. Our family will cry for us for some time, but after that we will fade from their memory. However much we work for our body, it will slowly deteriorate. However much we want to make our mind happy, the foolish mind will be wandering in the states of bardo and samsara. Please guru, bless me so that I can see that all this time and effort spent is meaningless. Some people say family is good for practice. Without money how can we do retreat, how can we make offerings to the monks? Without a healthy body, how can I meditate? Without a happy mind, I am not motivated to practice? So what is this verse talking about? But here what is meant is that you have to draw a line, how much time and effort do you want to spend in such pursuits? Does samsaric satisfaction benefit you in the dharma – making you wiser and attain enlightenment? Do not spend your time completely in samsara, spend your time meaningfully. The above verses are in regards with the four preliminary contemplations. The remainig verses concentates on the eight faults and it’s antidotes which I might bring forth in my next GRD message. Keeping you all in my heart and my prayers.